Steven Ronald Bochco (born December 16, 1943) is an American television producer and writer. He has developed a number of television series, including Hill Street Blues, L.A. Law, Doogie Howser, M.D. and NYPD Blue. Bochco was born to a Jewish family in New York City, the son of Mimi, a painter, and Rudolph Bochco, a concert violinist. He was educated in Manhattan at the High School of Music and Art. His elder sister is actress Joanna Frank. In 1961, he enrolled at the Carnegie Institute of Technology (after merging with the Mellon Institute in 1967, now known as Carnegie Mellon University) in Pittsburgh to study playwriting and theater. He graduated with a Bachelor of Fine Arts (BFA) in Theater in 1966, having also had an MCA Writing Fellowship. Bochco went to work for Universal Pictures as a writer and then story editor on Ironside, Columbo, McMillan & Wife and the short-lived Lorne Greene and Ben Murphy series, Griff, as well as Delvecchio and The Invisible Man. He wrote the story and teleplay for Columbo: Murder by the book (1971) and the teleplay only for several other episodes. He wrote the screenplay for the 1968 television movie The Counterfeit Killer and worked on Silent Running (1972) and Double Indemnity (1973). He left Universal in 1978 to go to MTM Enterprises where he had greater scope for producing. His first effort there was the short-lived CBS police drama Paris, notable as the first series on which James Earl Jones played a lead role. He achieved major success for NBC with the police drama Hill Street Blues. It ran from 1981 to 1987 and Bochco was credited as co-creator and also wrote and produced. The series also garnered considerable critical acclaim and many awards, and was nominated for a total of 98 Emmy Awards throughout its run. Bochco was fired from MTM in 1985 following the failure of Bay City Blues (1983). 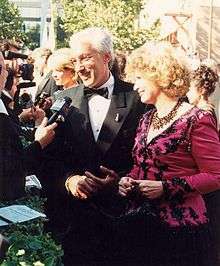 Bochco moved to 20th Century Fox where he co-created and produced L.A. Law (1986–1994) which aired on NBC. This series was also widely acclaimed and a regular award winner and achieved far higher ratings success than Hill Street Blues had enjoyed. In 1987, Bochco co-created the half-hour dramedy Hooperman which starred John Ritter but was canceled after two seasons, despite Bochco offering to take over direct day-to-day control of a third season. Hooperman was part of a lucrative deal with ABC in 1987 to create and produce ten new television series, which prompted Bochco to form Steven Bochco Productions. From this deal came Doogie Howser, M.D. (1989–1993) and 1990's Cop Rock, which combined straight police drama with live-action Broadway singing and dancing. It was one of his most high-profile failures. In 1992, Bochco created an animated television series, Capitol Critters, along with Nat Mauldin and Michael Wagner. After a lull, Bochco co-created NYPD Blue (1993–2005) with David Milch. Initially controversial at the time, the series was created with the express intention of changing the nature of network one-hour drama to compete with the more adult fare broadcast on cable networks. Other projects in this period that failed to take off include Murder One (1995–1997), Brooklyn South (1997), City of Angels (2000), Philly (2001), and Over There (2005). All five shows failed to match Bochco's earlier success though Murder One and Over There garnered critical praise. In 2005, Bochco took charge of Commander in Chief (2005–2006) which was the creation of Rod Lurie and brought in a new writing team. However, in spring 2006, he left the show because of conflicts with ABC, and shortly afterward the program was canceled. Bochco described his experience on the show as "horrible". In 2006 Bochco produced a pilot ABC show, Hollis & Rae, and was reported at the same time to be developing a baseball drama and another legal drama for ABC in partnership with Chris Gerolmo. It was announced in March 2007 that he has taken his first steps into internet TV with the 44-episode Cafe Confidential, each episode being 60-seconds of unscripted "confessions" by members of the public. Yet another legal drama entitled Raising the Bar was produced for TNT, this time in partnership with David Feige, although it was cancelled in December 2009 during the second season. According to an interview with Bochco published in September 2007, he is now winding down his involvement with network television, feeling that his tastes and current fashions in TV drama no longer coincide. "The network executives stay the same age and I keep getting older and it creates a different kind of relationship. When I was doing my stuff at NBC with Brandon (Tartikoff) and Hill Street, we were contemporaries," says Bochco. "When I sit down (now), they're sitting in a room with someone who's old enough to be their father and I'm not sure they want to sit in a room with their fathers." In 2008, Bochco argued that the new home for quality prime time drama is cable, where "the atmosphere is far friendlier and the creative environment more conducive to doing original work", and that "most of what's passing for primetime drama these days isn't very good". Prior to Hill Street Blues it was rare for American straight drama series to have story arcs, i.e. several stories running over many episodes (with the exception of prime time soap operas such as Dallas). It was also rare to have a large regular cast. The structure of the modern "ensemble" television drama can be traced to Bochco, who many regard as having changed the "language" of television drama. Since June 9, 2014, Bochco has written and executive produced Murder In The First, a series drama which he co-created with Eric Lodal. In 1970, he married actress Barbara Bosson, who appeared as a regular on Hill Street Blues. They had two children before divorcing in 1997. He is currently married to Dayna Kalins (m. August 12, 2000). His son, Jesse Bochco, by Bosson, was a producer/director on NYPD Blue and directed the pilot episode of Raising the Bar. Jesse Bochco also appeared as Captain Furillo's son, Frank Jr. (with Bosson playing his mother) on Hill Street Blues. Jesse has directed several episodes of his father's shows, including NYPD Blue, Philly and Over There. 1982 Outstanding Writing in a Drama Series, for Hill Street Blues, "Freedom's Last Stand"
1987 Outstanding Writing in a Drama Series, for L.A. Law, "The Venus Butterfly"
1982 Best Episode in a TV Series Teleplay, for Hill Street Blues, "Hill Street Station"
1995 Best Episode in a TV Series Teleplay, for NYPD Blue, "Simone Says"
1998 for NYPD Blue, the episode "Raging Bulls"
In addition to these awards, Bochco has earned induction into the Television Hall of Fame, which he achieved in 1996. Death by Hollywood: A Novel (2003). New York: Random House. ISBN 978-1-4000-6156-3. ↑ "Rudolph Bochco, 77, Violinist; Appeared With Top Artists". New York Times. ↑ An animated photograph of Bochco's own father, violinist Rudolph Bochco, served as the logo for Steven Bochco Productions; the music played over both the animated photograph and the 20th Century Fox logo was a brief segment from Movement 3, the "Presto" movement, of Concerto No. 2 in G minor, Op. 8, RV 315, "L'estate", the "Summer" concerto of Antonio Vivaldi's cycle The Four Seasons. 1 2 Gay, Verne. "He's not blue about leaving network TV". The Boston Globe, September 5, 2007. Accessed 2 July 2009. ↑ "Hollis & Rae". TV.com. ↑ Fox / Bochco / Gerolmo Civil Case Drama (2007). InBaseline. ↑ Cafe Confidential. Metacafe. Accessed 2 July 2009. ↑ Brookes, Emily. "Bochco takes TNT to court". C21 Media, 25 January 2008. Accessed 2 July 2009. 1 2 Newsday. "Case Closed". The Age, December 20, 2007. Accessed 2 July 2009. ↑ Schneider, Michael. "Leno's early shift rocks primetime". Variety, December 12, 2008. Accessed 2 July 2009. ↑ Bibel, Sara (September 19, 2013). TNT Orders Ten Episodes of Steven Bochco Drama 'Murder In The First' Starring Taye Diggs & Kathleen Robertson, TV by the Numbers via TNT press release. Retrieved September 20, 2013. ↑ 58th Annual Peabody Awards, May 1999.